Violet Crosby was injured after being struck by a car that jumped the curb on Tuesday, March 6, 2018. Three days later, she was showing strong signs of recovery. 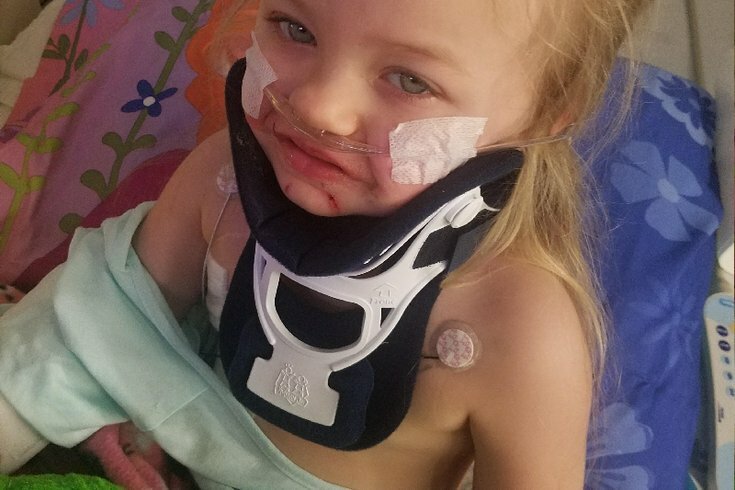 In the aftermath of a hit-and-run collision that nearly turned fatal, strangers are stepping up to help a single mother and her 3-year-old daughter still recovering from their injuries. Just before 7 p.m. on Tuesday, Celina Crosby and her two young daughters were walking near Tyson and Rowland avenues in Mayfair when, according to 6ABC, a white Toyota jumped the curb. The vehicle struck the single mother and trapped 3-year-old Violet underneath it on a nearby lawn. It took but one day for Philadelphia police to arrest the alleged driver, 31-year-old Zachary Lauer, who was charged with aggravated assault while driving under the influence and other offenses. The trio survived the crime with varying degrees of injury. One daughter emerged essentially unscathed and Celina suffered a broken leg while Violet – who had been in a wagon with her sister at the time of the crash – suffered broken ribs, a punctured lung and severe road rash. On Friday morning, Violet remained at St. Christopher's Hospital for Children showing remarkable signs of recovery, according to friends. "This little girl is so strong," said David Tressler. "Severe road rash will be treated with skin graphs. Broken ribs and her punctured lung were taken care of. Blood transfusion and blood work is good so far. They took her off the breathing machine and she's awake." With a goal of $5,000 on Thursday – it's the minimum he could have asked for, and they could use a lot more than that – Tressler has seen some $3,200 arrive within a day. That people turn to GoFundMe to help raise money for medical expenses is new, but this campaign has a unique twist. Tressler isn't a life-long friend of Crosby's. In fact, they only know one another through an extended line of connections, and via Facebook. Tressler said he joined the social media site late last year to get in touch with old friends. The connection to Crosby winds through Tressler's friend Amy whose cousin Dana Rodriguez is best friends with Celina. When asked by Rodriguez, Tressler donated some money to help the family during the holidays. When he got word of the hit-and-run, his initial inclination was to help out again. His boss donated $500, he and his wife donated $100 each and a fundraising mission was born. "I used to be a single parent, and I got hit by a drunk driver when I was 20 in Hulmeville," he explained of an incident that left him essentially unable to walk for two years. "We're not really close friends, but she seems like a nice person and I just felt compelled to do something to help." Though the mother suffered broken legs, she's yet to see the orthopedist "since she wants to be by her daughter's side, which I totally understand." "They took the breathing tubes out yesterday," he said of Violet. "She's awake, talking and giving little waves." He said he's messaged with Crosby to let her know she should worry about her injured daughter and not the financial ramifications. Thus far, news on both fronts has been positive. "I'm completely in awe of the amount of support that's coming in," he said. "I really hope and pray we can meet the goal and then some. A lot of times, these are community efforts. This is a worldly one." You can donate to the GoFundMe via this link.